We have many courses and training sessions coming up in 2019, aimed at making you a good roller skier getting you ready for skiing on snow. We have sessions in Hyde Park and Victoria Park in London, as well as Dorney Lake near Windsor, Redbridge in Essex and at Ascot Racecourse. Our regular venues are Hyde Park, Victoria Park, Dorney Lake, and Weybridge where we also run training groups which you can join after you have learnt the basics. From September onwards we will be building up for the ski season, with lots of possibilities for starting roller skiing and training. We are constantly instructing new skiers, and welcoming them to the sports of roller skiing and cross-country skiing. Beyond this, we are making regular skiers fitter and more prepared for challenges on snow and on wheels. 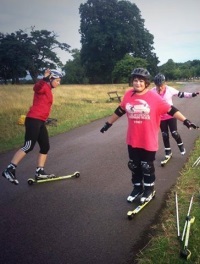 Our growing team of instructors is always thinking up new and interesting challenges for each week's sessions, with the aim of improving technique, strength and fitness on rollerskis. Our aim to make you a better skier - and have fun doing it - whatever your starting point happens to be. The fundamentals are balance, strength, fitness and technique, all of which you build up with every session. 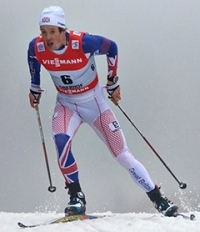 This Autumn we also have a couple of 'biathlon' courses, covering the skills of shooting as well as roller skiing, with laser rifle shooting instruction from GB biathlete and coach, Marc Walker. For beginners, the main option is a 5-week course or a 1-day course. We run the 5-week courses in Hyde Park and Victoria Park (East London), and these are good as they give your body and brain time to recover between sessions. They also let you focus on one technique. The 1-day courses give a great introduction into both techniques of skiing, classic and skating. The courses, which are held at Dorney Lake and Ascot, also include lunch. And at Castle Combe in Wiltshire, but without lunch (lunch is available at the cafe on site). You can find a full course listing here. These are all for beginners. But the 1-day courses also include options for more advanced skiers. We encourage more advanced skiers to join our 'club' training groups after the 5-week courses (see below), which offer more technical coaching and harder training sessions. This year we are making a big effort to bring in more youngsters to rollerskiing and cross-country skiing. We have specific junior sessions in Hyde Park, London and Brooklands, Surrey, see here. And we also have various discounts for younger skiers, see here. 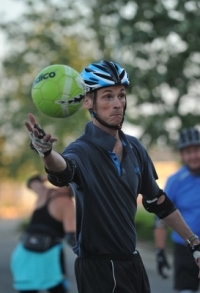 Our instructors are available to run sessions for individuals and groups, during the week as well as weekends. Jordan is available in London (most weekdays) for one-to-one sessions and smaller groups. Felicity can do sessions at Dorney Lake, Brooklands, Richmond Park and Oxfordshire during the week, as well as larger groups in London. Details of our private instruction is here. We also do private groups such as after-work events, stag and hen parties, and birthday sessions (for adults and kids). We run three main regular training groups. Our Hyde Park club has been established since 2006, and each week we have a Saturday AM session with three instructors and three groups, and a smaller Tuesday evening session. Both offer a mix of training and instruction. On Saturday at least one group will do classic and one will do skating technique, and we are always keen to introduce new members. We also will be adding Victoria Park (East London) later in February. You can find our Programme here. And the Thames Valley Cross-Country Ski Club offers regular training sessions in Brooklands and Wallingford / Oxfordshire, see here. We have a lot of people training for ski marathons and other ski challenges, and others training for general fitness and strength. 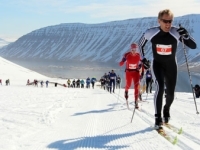 Sessions are designed to improve technique, strength, endurance and agility - all essential for cross-country skiing and good for other sports and activity. You can sign up for the Hyde Park club here. There are options to pay per session, quarterly or monthly by Standing Order. You can find some feedback on our sessions here. Also we have been reviewed by various folk, including the Sunday Times, Sports Sister and Sky Game Changers who recorded a session we did for the charity, Streetgames. We have a great team of instructors, we provide excellent equipment - rollerskis, boots, poles and protection - and we have a great passion for bringing the very best rollerski instruction to every session.